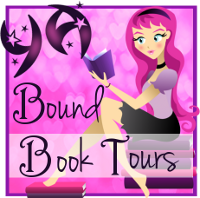 YA Bound Book Tours: Book Blitz Sign Up: The Regulars by Paris Singer! A man wakes to find himself dead and alone in a forest and soon realizes he has no memory of who he is or how he came to die there. As he sets off to unravel the mystery of his past, he is pulled into a world stranger than death itself, where the struggle to balance good and evil lies behind the scenes, in the shadows. 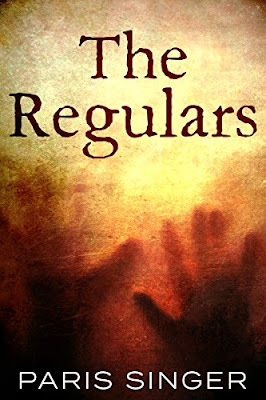 On his journey, he encounters The Regulars, a self-proclaimed band of misfits whose sole purpose is to terrify the living. Among them is Mr. Cage, a nefarious, dark jester who delights in causing havoc, misery and pain to all those whom he encounters. For the second time, I woke to a pair of eyes, though this time they weren’t those of the boy. I didn’t even know we could pass out.” The face of the spider-like man was again inches from mine. Instinctively, I pulled my head back away from his and it collided forcefully with the floor. The man smiled his crooked smile as he winked and withdrew. “You okay?” asked a voice to my right, which I recognized as the boy’s. “Yes, I think so.” I put my hand to the back of my head as if to feel for blood, though soon realized the absurdity of it. “Who are you?” I asked again. “Last but certainly not least, we come to me. It has always been unfortunate and rather inconvenient that I cannot recall the place from which I awoke, so no easy name could be conjured. As such, therefore, from the very depths of my being, I came to the name Louis. If you need an explanation, I shall simply say that it stirred me within. Louis took a half bow as the one they called Mr. Cage jumped up and down in wild excitement, clapping his hands, his bowed legs half bent. The girl clapped without a hint of expression save that of her glazed eyes, which told of a dark sorrow deep within the wells of her being. The boy just gave another empty half-smile. “What about him?” asked the boy. The boy turned, looking down at me. “Come on, we’d better go.” He started toward the other three as they walked through and past the barred door, out of sight. When the last of them had gone, the boy picked up his pace, and I discerned that in a few moments he, too, would be gone, leaving me alone in the diner. I’d hoped they’d forget they had even met me as soon as I was out of their sights, that I’d be free of them—especially of Mr. Cage—but no sooner had I formed ideas of what I’d do next, the boy’s face re-emerged from the door. With those words, I knew my only choices were to follow them or tempt the wrath of beings that, despite being akin to them, I was certain possessed attributes and abilities whose capacities were beyond my imagining. My mind attributed them with boundless power, theirs to use at a whim against whomever they pleased. Feeling I had no choice, I stood and walked to the boy. Then emerged an urgent panic within me as I realized what was casually being asked of me—I had to walk through the barred door. I was to hit the ground running. 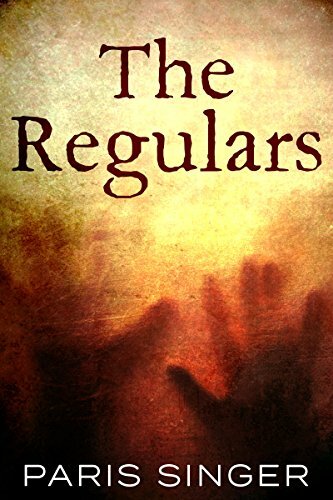 I knew I hadn’t long in which to figure out how to actually do it, for the greater half of “The Regulars” was rapidly getting farther from us, and I didn’t know what their response would be upon seeing that neither I nor the boy were within their number. 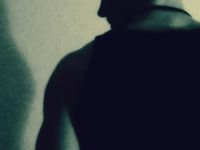 I hadn’t been among them long enough to be able to determine whether the boy would get similar treatment as that to which I was certain I would receive, should he be found to step out of line. I knew nothing about him; still, I felt an inexplicable fondness toward him, much as a father would for his son, and was grateful the boy had awoken me from the perpetual slumber I had fallen into. I owed him. “What do I do?” I asked. I stopped. I needed a moment to gather my thoughts. I wondered whether it really was that simple. Just do it. Just walk through a door. They’d done it, so had the boy, but they were ghosts. Christ, so was I. I was like them. The whole world was crazy—the whole universe—but there it was, and I had no choice but to follow. And it had to be right then. I looked at the boy, into his eyes, and he into mine. There was a note of impatience within them, but also one of belief as he gave me a single nod of encouragement. I opened my eyes in time to see I was but a few centimeters from a tree. I turned so as to avoid colliding head first with it, and just as I had expected to feel the crushing blow, I instead felt nothing. As I opened my eyes again in wonderment of where the tree could possibly have gone, my face met forcefully with the earth.